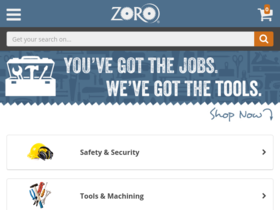 Zoro, online at zoro.com, is the destination for industrial supplies, tools, and more. Zoro carries tool storage, power tools, hand tools, work gloves, head protection, plumbing fixtures, water heaters, ladders, shelving, and more. Before shopping at Zoro, be sure to stop by RetailSteal for the latest Zoro coupon codes, Zoro discount codes, and Zoro promo codes. Zoro also offers shipping promos that change often. Visit RetailSteal for the latest Zoro shipping specials. Act now and enjoy a 20% discount on select categories with this coupon code from Zoro. Save 15% with email sign up at Zoro. Shop hand tools for under $1 at Zoro. Enjoy free shipping on orders $50+ at Zoro. Enjoy exclusive promos with email sign up at Zoro.